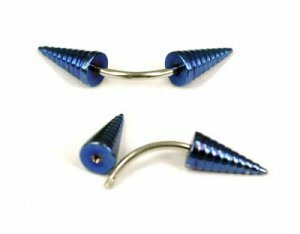 Dark Blue eyebrow curve spike piercing. The barbell is made out of surgical stainless steel. the spike has swirls on it. STAND OUT FROM THE CROWD!! It is 16G. - Its 16G (1.2MM) 316L surgical steel. Item is shipped within three business days of payment approval. Please allow ample shipping time depending on the item destination, your patience would be appreciated :) We offer free shipping to most countries. If you have ANY problems, concerns or questions please contact us for a prompt response. Once the item has arrived we would appreciate Your feedback and rating. As we are an online store We depend very heavily on customer satisfaction and good ratings. Before leaving negative or neutral feedback please contact us.